At Lining & Coating Solutions, we are proud to offer the latest technology in non-destructive pipe repairs. Our underground, trenchless pipe lining solutions allow our specialists to solve problems in pipelines without digging a trench or tearing down a wall to access your pipes. We service all types and sizes of commercial, residential, industrial properties, and municipalities. Trenchless underground pipe lining is a new method available for repairing broken pipelines. Unlike the older methods of repairs that required heavy machinery and weeks of time to expose leaks or cracks before the fixes could be made, our trenchless solutions keep the solution short and easy to install. This saves significant amounts time and money for businesses, ensuring that these commercial industries won’t need to close their doors for long periods of time and that new pipeline systems won’t need to be invested in. Whether it’s a pinhole leak, pipeline break, or misaligned joint, our contractors can get it fixed. For the underground sewer pipe lining process to be successful, we deploy a camera inspection of the pipe. This allows our specialists to gain an inside look at the interior of the pipes without tearing them open or digging around the exterior. We use a high-quality camera to accomplish the task by inserting it using an existing access point and running it through the line. The camera feeds the live video footage back to a portable screen for us to review. With our equipment, we can inspect up to 1,500 linear feet of hard to reach pipe up to 200 inches in diameter. This feed can also be made available to you upon request. Once the pipe has been inspected and the problem found, the pipe is then cleaned with hydro jetting equipment. 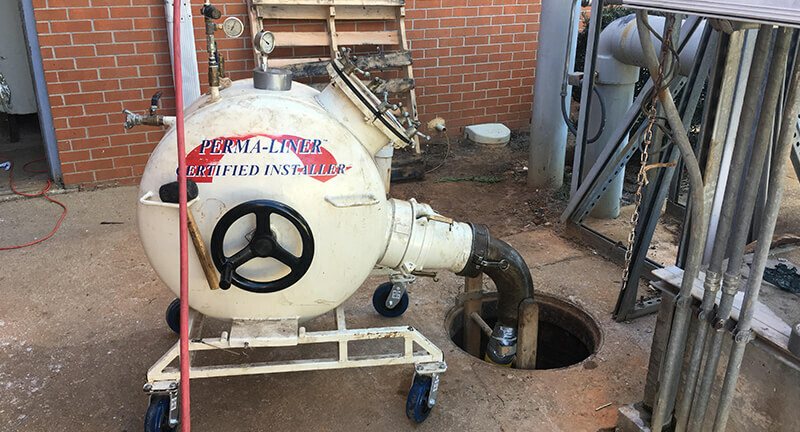 This allows the debris to cleared so the water flow can be restored and the walls of the pipe are smoothed back to their original state, and this process can also be used to remove clogs formed by grease deposits or other types of organic material. 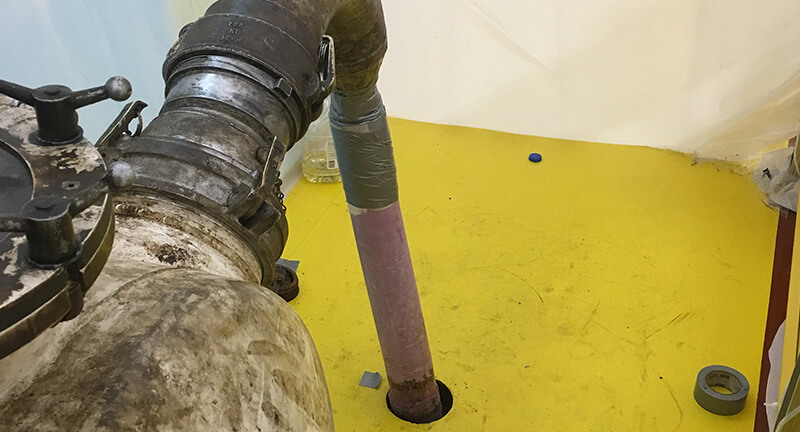 After the cleaning process is complete, an inflatable tube is placed inside the desired pipe through an established access point like a cleanout or the small hole that was used to conduct the camera inspection and cleaning services. An artificial bladder is positioned inside of the tube, and the outside of the liner is coated with epoxy resin. Once the bladder is inflated, the epoxy is pressed against the interior of the pipe. This allows for even distribution of the resin and forces it to keep to the shape of the pipe. Over the course of twenty-four hours, the epoxy cures and hardens. The artificial bladder used to inflate the liner is removed and the pipe is ready for usage. 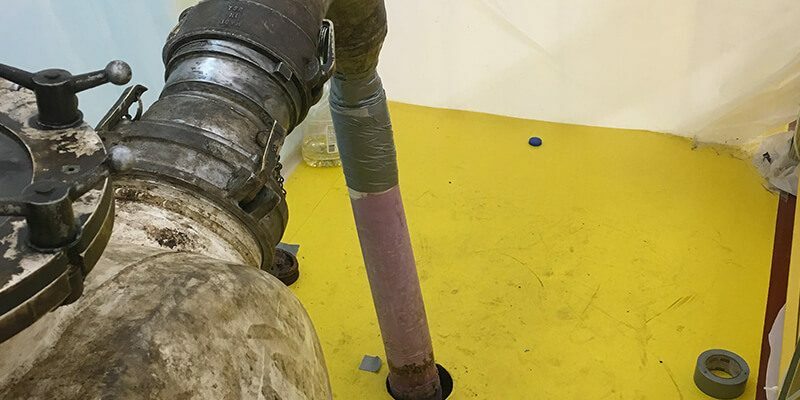 With these steps in place, there is no need to remove the old pipe if the epoxy was used to replace it entirely, as it forms a hard shell inside the original, creating a new pipe within the former one. At Lining & Coating Solutions, we are the leaders in effective trenchless underground pipe lining solutions. To learn more about our services and how we can assist you, call us at 888-345-5112 and we look forward to working with you!